American athletes arriving to compete at the 2008 Olympics and wearing protective masks inside the Beijing airport they were acting like jerks. Yeah, no kidding, the air in Beijing is worth complaining about. These are athletes at the peak of their conditioning. But they can’t endure the air inside a building? While they’re walking, rather than running or breathing hard? And for the few minutes it would take to get past all the photographers and into the privacy of their buses or cars? But complaints should come in the context of realizing that Chinese officials, companies, and citizens actually have done quite a lot to try to cope with the problem (details here) — and that it’s sad in many ways, rather than contemptible, that the first view the world’s TV audience will have of spiffed-up Beijing will be of the opaque gray-brown skies. Unless, of course, there’s a big cleansing wind out of Mongolia right now. Well, the above cartoon is not my finest work but I can keep my head up knowing I was able to draw something on the issue of smog and the coming Beijing Olympics without having to rely on using two very overused visuals, the gas mask, and the 2008 logo: (as has been the case with other cartoonists) here, here, here, here, here, here, here, and here. No offence to my cartoon friends, but the logo parody has been done to death, hopefully restraint can been exercised in the weeks to come so we don’t have to see another. Further apologies to other cartoonists whose similar work I neglected to link to. This isn’t to say logo parody cartoons shouldn’t be done, but I think they should be drawn sparingly, and only if there’s a great idea. 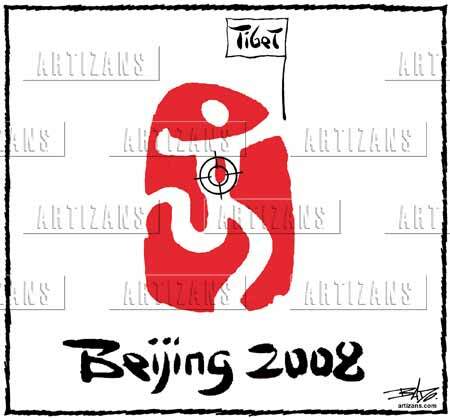 The concept of showing the stylized figure depicted on the Beijing Olympic logo as a truncheon bearing police officer is a great visual, but I’m not sure even a week to go before the games begin many people are familliar with the actual logo. Among many editorial cartoonists I talk to logo cartoons are often viewed as being easy in and outs enabling the cartoonist to take the rest of the day off. It doesn’t take much to punch in the words ‘Beijing’, ‘Olympic’, and ‘logo’, into Google images to find a wealth of visuals of varying resolution, before manipulating one and handing it off to the editor for approval. Cliches, metaphors, and proverbs are very important instruments cartoonists use to draw their commentary. While I and others groan at the overuse of some of the gags and scenarios seen in editorial cartoons editors tend to gobble them up, certain that the readers are going to easily understand what point is being made. Sometimes they become so overused it makes it easier for the lazier cartoonists to blatantly plagarize others. Please feel free suggest new ones through the comment box to add your own to the list. THE OLD…Puzzle with a missing piece(s) editorial cartoon. 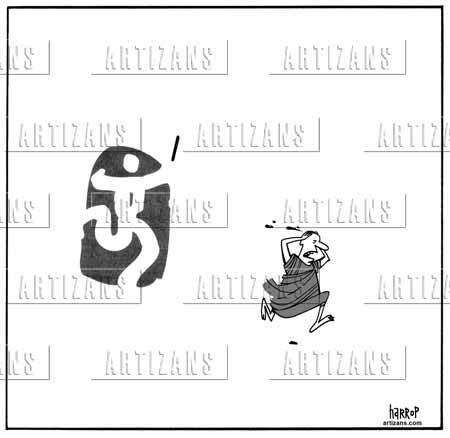 THE OLD…Painting oneself in a corner cartoon. THE OLD…Walking the plank cartoon. THE OLD…Large fish eating the medium-sized fish eating the small fish gag. THE OLD…Things proceeding as slow as a snail/turtle gag cartoon. THE OLD…Image of a beaver representing Canada. THE OLD…Image of Uncle Sam representing America. THE OLD…Donkey and Elephant representing the political parties in the U.S. THE OLD…Hear no evil. See no evil. Speak no evil cartoon. THE OLD…Combination of two unrelated current events. THE OLD…Loon on a Canadian dollar drowning/choking/spashing during currency fluctuations cartoon. THE OLD…Ostrich head buried in the sand gag. THE OLD…Blind justice statue editorial cartoon. THE OLD…Incorporating popular cartoon characters iE: Homer Simpson, Mr. McGoo, Peanut’s characters, etc. in an editorial cartoon. THE OLD…Dividing a continent/country up and pointing to different regions with satirical names gag. THE OLD…naughty pupil writing lines on a chaulkboard cartoon. THE OLD…”kick me” sign on the backside of a politician gag. THE OLD…Adam and Eve in the garden of Eden image. THE OLD…finger in the dike cartoon. THE OLD…labyrinthe image to convey, timelines, bureaucracy, etc. THE OLD…target plastered on a person image marking imminent firing, defeat, death, etc. China has sharply criticized foreign reporters here over their coverage of the riots in Tibet, accusing them of biased reporting and preventing them from traveling to Tibet or neighboring provinces to report on the unrest. The government has also increased its propaganda campaign aimed at convincing the Chinese public that the Dalai Lama, the exiled Tibetan leader, instigated the violence in Tibet on March 14 and that China was a victim of separatist terrorist activity. 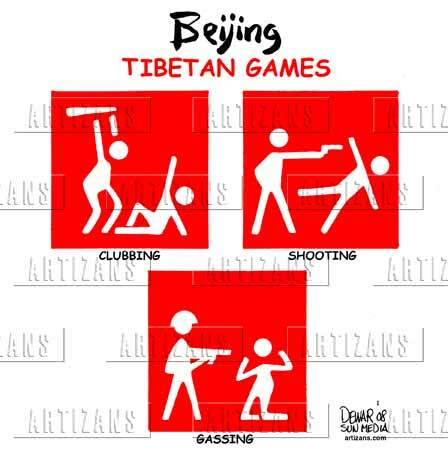 The campaign is the clearest sign of China’s concerns that the Tibet unrest, as well as anti-government protests over Darfur, could disrupt the Olympic Games this summer. In a sign of the tension with the media, three members of the Athens chapter of Reporters Without Borders, a media-rights group based in Paris, disrupted the Olympic flame-lighting ceremony in Greece on Monday. The incident occurred as Liu Qi, president of the Beijing Organizing Committee, was addressing thousands of spectators, dignitaries and Olympics officials.